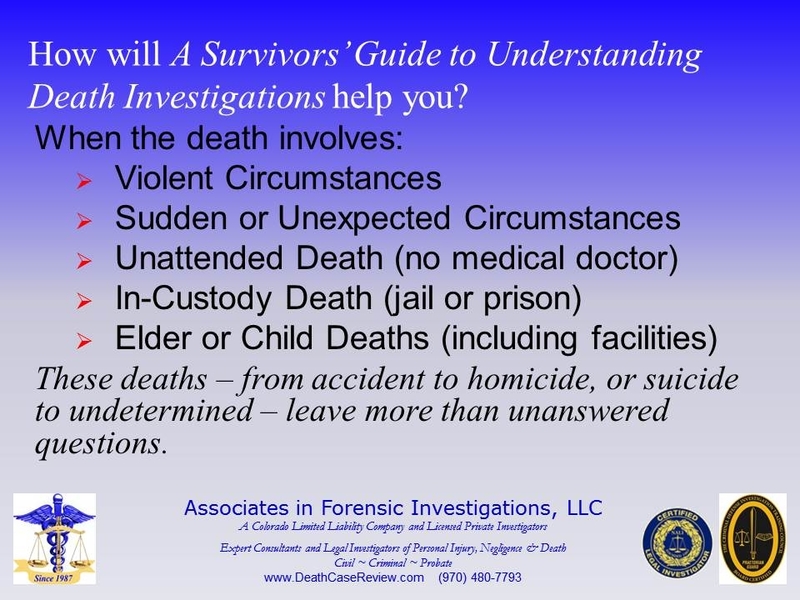 This Survivors’ Guide to Understanding Death Investigations is a basic introduction into the concepts of the official investigation of death, such as by a coroner or medical examiner office. It is our hope that understanding these concepts will help the process of healing and closure. Official protocols and statutes vary from agency to agency and state to state. Please consult your local investigating agency or legal counsel, as appropriate. This guide is based upon a combined legal investigative experience of over 30 years and a combined official death investigation experience of over seven years at a busy and unique coroner/medical examiner’s office. At that office the candidate investigator had to first complete a thorough 6-9 month training academy. If accepted, an on-the-job volunteer internship position may be offered, followed by a part-time paid position. Both Dean and Karen completed each of these modules (Dean from 2002 to 2008 and Karen from 2004 to 2006). In 2004 Dean was offered a full-time position. The duties of all trainees and investigators included being on call for 24 hours shifts, multiple shifts per week, responding to scenes and completing thorough and independent investigations, transporting the body and preparing for autopsy. In addition, the most dreaded and responsible component of the process included the determination, location and notification of the decedent’s next-of-kin. Deaths investigated included fetuses to the elderly, natural deaths to homicides and home deaths to multi-vehicle collisions. Today we devote ourselves to the words of Voltaire, "To the living we owe respect, but to the dead we owe only the truth" through the wisdom of Sherlock Holmes, "It is a capital mistake to theorize before one has data. Insensibly one begins to twist facts to suit theories, instead of theories to suit facts." This guide is intended to provide survivors some of the knowledge and insight to informatively and intelligently understand the concepts and protocols of death investigation, and the ability to ask the right questions.